Spicer said this in his introduction of Tuesday’s White House Press Briefing. He mentioned that President Trump “on Monday spoke with President Buhari of Nigeria, President Jacob Zuma of South Africa”. Spicer also noted that Trump received the Prime Minister of Canada, Justin Trudeau. 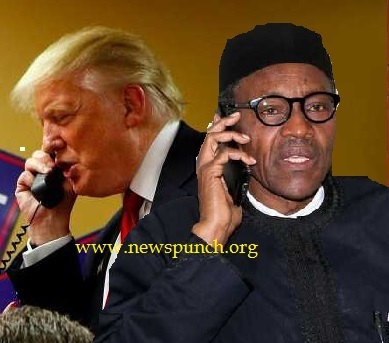 President Buhari who is in the United Kingdom spoke with Trump on telephone at the request of the latter. His spokesman, Femi Adesina, said the chat was cordial. He said President Buhari congratulated Trump on his election as President of the United States and on his cabinet. Adesina added that both leaders discussed ways to improve cooperation in the fight against terrorism through provision of necessary equipment. He said Trump also commended Buhari for the efforts made in rescuing 24 of the Chibok Girls and the efforts of the Nigerian military.